Left and Write: I: Iron Fist! They used Cap to hook me in...dirty dogs! 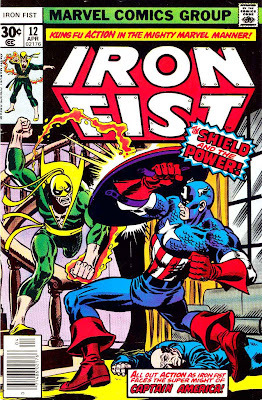 Iron Fist was created by Roy Thomas and Gil Kane back in 1974 during the height of the 'kung fu craze' that was sweeping the country. Iron Fist, along with Shang Chi: Master of Kung Fu were Marvel's attempt to cash in on the popularity of Hong Kong action films. Iron Fist had his own title for a while and also shared the spotlight with Power Man (Luke Cage) in the pages of Power Man and Iron Fist. 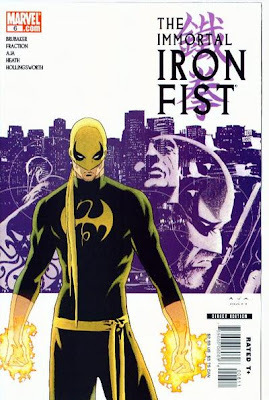 Back in 2006, the character was revived in the pages of The Immortal Iron Fist...written by Ed Brubaker and Matt Fraction, drawn by David Aja. Iron Fist was born Daniel Rand. His father, wealthy businessman Wendell Rand, has stumbled upon the mystical city of K'un L'un in his travels and stayed for awhile. After saving the life of the city's ruler, Lord Tuan, he's adopted as a son and leaves, soon after, to pursue more fortune back in America. Years later, Rand returns with is wife and nine year old son Daniel as he leads another expedition to find the fabled city again. Both of Daniel's parents are killed, accidentally, and young Danny is taken to K'un L'un...eventually, as one of the more promising pupils, being taught it's mystical brand of kung fu. Heightened physical attributes-- Danny can push himself for up to an hour before suffering any sort of fatigue. Immunity to pain and injury. A 'mind meld' of sorts, being able to merge with another person's consciousness. His main power, though, is his namesake.....the Iron Fist. By focusing his chi energy, Daniel can make his fist superhumanly powerful and, temporarily, immune to pain and injury. This process is draining, though, so he has to use it sparingly. Of course, Rand is an extremely accomplished master of the martial arts and physical combat. He's also a fair businessman as well as an amateur, street savvy, investigator. I've always been a fan of the old late night, t.v. 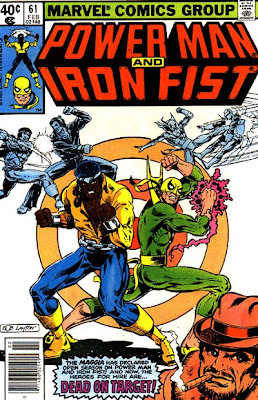 kung fu shows and, back in the day, Iron Fist was right up my alley. The issue at the top, with Captain America on the cover, was one of the very first issues of a Marvel comic that I ever bought. Interesting tale of chi, death and power. Q: Were all the superheroes orphans? I don't remember Iron Fist! Thanks for enlightening me! Don't know Iron Fist, a good one though. I like the connection Iron Fist has with a mystical form of kung fu, it just made him that much more awesome. i have seen him, but i really don't recall what he did... thank you. My hubby is walking the dogs right now. I'm going to impress him when he comes home with my sudden knowledge of Iron Fist. ssshhh. Thanks Mark!! I don't remember that guy at all. You're digging out some interesting heroes. Iron Fist, eh? I had totally not thought of the marketing angle of superheroes (as in responding to the Kung Fu fad)--makes sense I guess. When I read posts like this, I wonder when and why I stopped reading comic books. I like him already. Some of the super heroes they thought up back then make me snicker a little, but this one sounds really cool. Ditto on what Rebecca wrote! I loved Iron Fist when he came out because he was so different, human and superhero at the same time. I have to admit I'm a huge fan of "Grasshopper" and an Iron Fist comic hero seemed more than cool. I really liked the art in the Immortal comic best. I'd like all of those powers, especially the fast healing and no pain. I take that iron fist, too! Just in case. Do you have copies of all these great comics? I love all those powers! I missed so much not reading these! Oh how I could use some of the super powers right now! Especially the augmented healing. Iron Fist is awesome. I like the Iron Fist. I think I like the real name of Daniel Rand too. Reminds me of Bruce Wayne. I was and still am a fan of kung fu movies. Funny, but in a way I am trying to harness my chi as well. @Nancy: It sure seems that way, sometimes, doesn't it? @Sheena: A good character,just didn't get that much exposure. @Misha: Yes, he was pretty cool! @Trisha: That was the one of the fun things about him...he wasn't just a one trick pony. @LD: A lot of these guys seem to fall between the cracks, for sure. @Hart: Oh yeah, it was big business even back then...bigger business now, for sure. @Cheryl: Those days, comics were still fun...these days, not so much so I can see why people stop reading. Thanks for stopping by! @Lisa: I'm sure they got a lot of "Kung Fu" fans on board and I agree...Aja's art is very cool. @Lee: I'm sure a lot of us would like that Iron Fist...lol :) No, I used to have a lot, but sold them a few years ago as I began to buy less and less. They just weren't the same as when I was a kid, unfortunately. @jaybird: I hear you on that! @Mina: I never thought of the name angle, but I can totally see it, sure. @Al: Me too, I always used to love those when cable t.v. first came out and it's all they showed. They say people can do it, so it's not as far fetched as it seems. I loved the "Kung Fu Fighting" craze when I was a kid, not that I could do any of it LOL. Iron Fist is cool. I am not at all surprised to hear that they might turn Iron Fist into a movie. Martial arts are still very popular AND comic book hero movies have turned out to be very profitable. Marvel has had excellent results at the box office. If this movie does well, it would be no surprise if they brought Iron Fist on board for a future Avengers flick. The Iron Fist's story is cool. I like the updated version of him. Sleek. DC guy, so never read any of the Iron Fist comics. "Everybody was Kung Fu Fighting" - oh yeah, the Kung Fu craze! Love that there might be an Iron Fist movie in the works! And don't worry about the length of your posts. They've been great to read! Had to laugh at your Wonder Woman comment at C lee's blog. I won't mention here to save your man card ... Loll. @Robin: Oh yea, totally agree. If they keep doing Avengers films, who know who you might see? @Christine: He has tons of backstory, I was just trying to keep it condensed. A very interesting character, though. @Samantha: Very true. Tragedy does seem to forge quite a few heroes. @Alex: I'm not sure if D.C. ever had an equivalent besides the Karate Kid from the Legion of Superheroes. I like the story of the lost tribe. Yahoo for Green Lantern. There had to be a kung fu superhero. He sounds pretty cool! Have I told you how much I love your theme?! @Susan: Same here..I always like stories about places like Shangra La. @Heather: Thank you very much! I love kung fu! Iron Fist sounds so freakin' cool. I am so glad to be learning more about classic comics. I will definitely watch that movie if it comes out. OMG. Thanks for stopping by my blog and for inadvertently reminding me that we are supposed to be keeping these blogs short. So, I suppose I should be thanking you for reading my stories (not blogs). Thanks for your patience and comments. Looks like you have quite a passion here! Nice job describing Iron Fist for the rest of us. @Shell: I'd sure watch it, too! @Krista: Yeah, 30 cents seems like so long ago...and, I guess, it was.